For Fern Elementary students, the first stop of the day is the cafeteria. 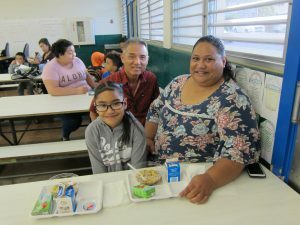 “The school has made eating breakfast part of a whole program of positive support,” said first lady Dawn Amano-Ige. 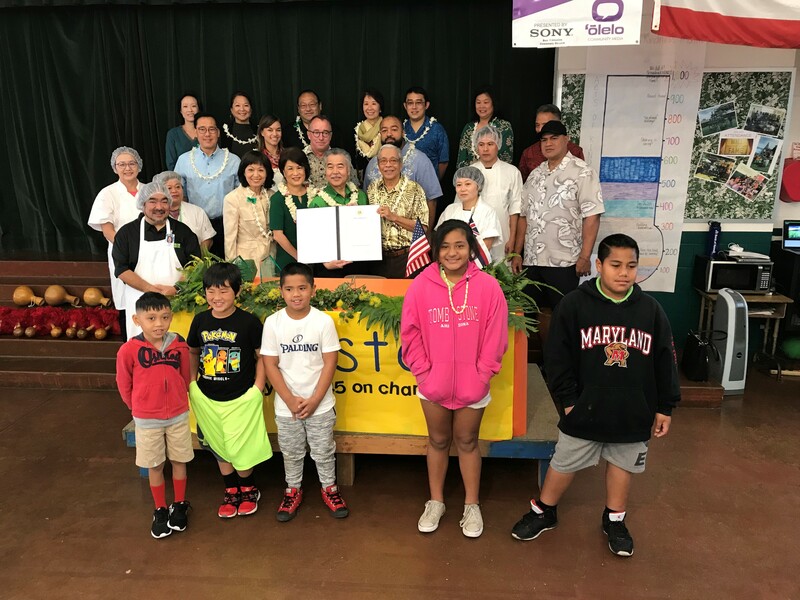 The governor and first lady chose Fern to help kick off “School Breakfast Month” in Hawai‘i March 1— part of the statewide Jump Start Breakfast campaign chaired by Mrs. Ige. The students at that day’s morning assembly cheered as the governor (a regular breakfast eater) offered his own version of the Fern slogan. “We achieve because we believe . . . and we eat breakfast!” he said. The first lady emphasized, “Breakfast gives you a great start to learn, grow and be successful. We want the whole state of Hawai‘i to know, as you all do, how important eating a good breakfast is.” On that day, breakfast was a kalo bowl with yogurt, granola, pineapple, poi and breadfruit. The “Fernsters” also produced a video, “The Breakfast Rap,” and a “Keiki Makua Breakfast” chant. The governor and first lady with the “Fernsters” for the proclamation. The Jump Start Breakfast campaign will continue in the coming months with support from local community organizations and a national No Kid Hungry grant. Ten pilot schools statewide will be trying different options — grab-and-go, extended breakfast hours, and new menu choices — to see what works best for their students. Principal Glen Miyasato with parent Hala Leitu and daughter Abriella. The Jump Start campaign is part of a bigger program of positive support in a community that has its share of challenges. Every school day Miyasato, Fern’s vice principal and staff take turns walking a crowd of children along a busy highway to school from Kuhio Park Terrace. “It’s our ‘foot-mobile,’ said Miyasato, who has launched this and other programs to create a safe haven for Fern students.